Balustrade consists of balusters with a cap and base. Die blocks with a cap and base are often included. Always check with your local building codes for guidance. 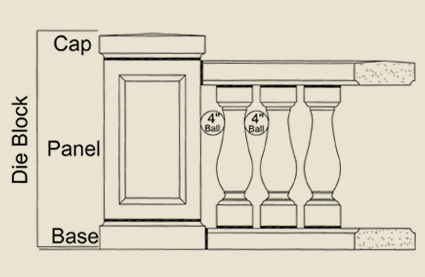 Most building codes allow for no more space between each baluster than a 4″ diameter ball can pass through. 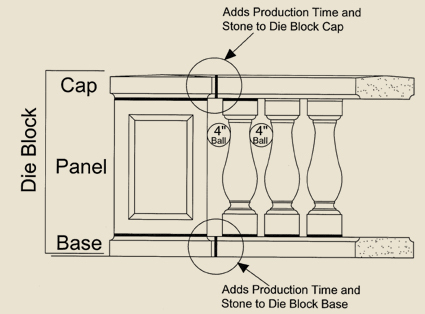 Another way to save on your stone budget is to have the balustrade cap die into the die block and not the die block cap. Each panel on a die block increases cost. To help demonstrate the additional costs, see above. Potentially improve your stone budget by detailing this.